:This ruggedly designed tan canvas Bible cover wonderfully reminds you, your son, husband, or uncle of how amazing the Lordâ€™s grace is. It features the text of the beloved hymn, â€œAmazing grace how sweet the sound,â€ on the bottom of the Amazing Grace Tan Canvas Bible Cover. Whether heâ€™s heading to church, class, or Bible study, he will be able to protect his Bible with this Christian Bible cover. It will keep his Bible from getting wet or muddy, and also keep all his important notes, pens, pencils, and study materials together in one place. 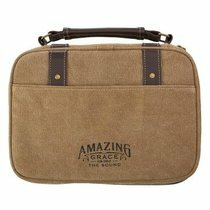 About "Bible Cover Canvas Medium: Amazing Grace, Tan, Carry Handle"